The customers were very happy with the excellent cushioning of the Asics Roadhawk FF. The runners highlighted how the snug fit of the upper prevented sliding inside the shoe. According to the wearers, the shoe’s light weight increased their efficiency during running. The purchasers found the price of the Roadhawk FF very reasonable. A runner considered using this shoe for an upcoming marathon owing to its great all-round features. Some users were dissatisfied with the narrow toe-box of the Asics Roadhawk FF. The Asics Roadhawk FF has certainly earned a good number of followers owing to its affordable price and agreeable build. They also lauded the lightweight nature of this road shoe, as well as its comfortable cushioning and other efficient features. However, there were those who felt very restricted because of its apparently narrow forefoot section. I buy my shoes in cohorts. I generally go through a training cycle, finish a major race, and then look to replace worn out shoes with new pairs that will fill a hole in the roster. 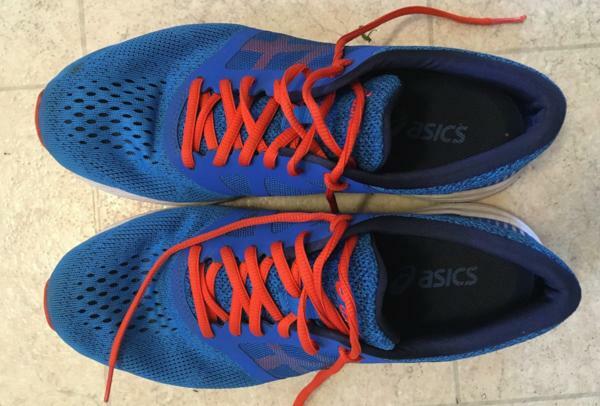 I bought my Roadhawks in January 2018, looking for something lighter and speedier to wear on tempo runs, and maybe as a race shoe for my first Boston Marathon in April 2018. They were very quickly out of the running as a race day shoe. They became my go-to for tempo runs in my spring training cycle, but I haven’t worn them as often since Boston. They don’t soften the blow, so make sure you run the light when you run fast. During my spring 2018 training cycle, the Roadhawks were quickly out as an option for race day, and therefore also out for long runs. They just didn’t have the cushioning I needed. Instead, I used them weekly for tempo training runs. With an aerodynamic construction, they feel fast, and I flew on many of those workouts. I also wore them for some aerobic consistency runs. I’ve now pigeonholed them as a tempo training shoe. However, I don’t use them for every tempo, because of their unforgiving firmness, and my propensity for injury on hard efforts. Despite the lack of cushioning, I seriously considered wearing them for my fall 2018 marathon, as I perceived them to be lighter than my early choice, a pair of Skechers GoRun Ride 6. However, after checking the facts on all my runners, I was shocked to realize the Skechers was actually a bit lighter. And since they were far and away more comfortable and cushioned over long distances, I put the Roadhawks back in the closet. In the end, these are a trainer only for me, through and through. They’re too heavy for a fast half marathon, and not cushioned enough for their weight over a full marathon. Overall, they fit perfectly. Not a lot of room in the toe box, but not a lot of room needed. No movement in the heel or mid-foot. However, I do have to be mindful of giving the laces some extra tugs or double knotting them, as the upper’s material and lace construction makes them prone to loosening over the course of a run. I’ve had them untie more than once. They are unforgiving as far as cushioning goes, among my stiffest pairs of shoes. This has posed a problem late in training cycles when my form isn’t as strong, especially when I haven’t been diligent about rolling out my muscles and stretching. I injured my hamstring while wearing them on one run late in the build-up to Boston. Of course, this wasn’t the shoes' fault, but I wouldn’t recommend them for runners who are injury prone. They offer little in the way of support and cushion. Over the last few months, I’ve swapped them out for my New Balance Fresh Foam Zante v3 more often than not on tempo runs, because I feel like I’m able to pay more attention to form in the Zante. The Roadhawk has a larger drop (8mm vs 6mm), perhaps contributing to a less natural stride. I also don’t love the upper’s material. It’s not very breathable, another reason I gravitated toward the Zantes in summer training. The Roadhawks did feel nice and warm during the winter training months in Southern Ontario. Don’t wear them on icy days though, there’s not much traction there. No traction here. For clear roads only. Lastly, I’ve now put 375 kilometers on them, and they don’t feel or look much different than the first few kilometers. I expect they’ve got a fair amount of life left in them. Some creasing in the foam after 375 kilometers, but still looking and feeling good. They make me happy but they don’t make me rave. Asics Roadhawk FF is built for speed and flexibility. At 8.6 ounces (men’s) and only 6.7 ounces for women’s, the Roadhawk FF is one of Asics lighter shoes and helps the runner to remain quick and nimble. The Roadhawk is built with Asics ® FlyteFoam™, Asics’ midsole technology that uses organic fibers which helps reduce packing out that usually happens with softer, low-density foams. It also provides a quick/bouncy step. I found the shoe dependable and responsive in short or long distances. The soft upper also supports the foot and ankle while looking very stylish and sleek with its seamless construction. The drop is helpful to keep the runner positioned forward. Drop: Weight: 8.6 oz. Heel Height: 20mm. Forefoot Height: 12mm. Roadhawk FF uses 45-degree full-length SpevaFoam™. Asics uses seamless materials which reduce possible friction and irritation caused by traditional stitches and seams. It provides a soft platform feel and good comfort. They come with a removable sock liner that allows for personal preference on the thickness of sock. It's also very comfortable with no sock at all. My medical orthotics fit nicely in this shoe and allowed room for natural foot splay and movement. At the current price of $49 dollars—Roadhawk FF is a steal, but at this price—you need to move fast to select from several different colors. Very breathable synthetic-mesh upper which is “lite”-weight and allows air into the shoe. Perspiration evaporates quickly and keeps the foot cool and dry for shorter or longer runs on both road and trail. Tongue and lacing system are normal and stay in place no matter how aggressively you run. The Roadhawk contains Asics® High Abrasion Rubber (HAR) which reinforces the outsole with excellent durability. Roadhawk FF has an HG 10MM ® heel gradient which keeps the runner in excellent forward position enhancing efficiency and easing the strain on legs, knees, and ankles. The Roadhawk FF is a great road shoe and many given its light weight and durability, many use it for competition at short and long distances. I took the Roadhawk FF on the trail and had had loads of fun, flexibility, durability and enjoyed good traction on uneven and different surfaces. The upper was also comfortable on the trail and provided good protection. Arch support is neutral. Some reports suggest the shoe runs thin and has a narrow toe box, however, I found the toe box to be very comfortable despite my wider feet with orthotics. I found thicker or thinner socks were not an issue. Roadhawk FF can also be worn without socks. I found a very evenly distributed push-off with this shoe with an even platform for acceleration. For the money and for the ride, I highly recommend the speedy & swift Roadhawk FF. When Roadhawk FF in spring of 2017, it seemed a must try for my fall training season. Having trained in Asics shoes several times before, I was incredibly interested in the different style and take they were trying out with the Roadhawk FF. While the shoes are technically sold as competition trainers, they served me well as a light-weight, cheaper alternative for daily training shoes. The Roadhawk FF has done especially well in the design of their upper. While there is nothing incredibly noteworthy or novel on the shoe, everything is simply but effectively designed. That is, the shoelaces and eyelets remain completely intact—even after lots of wear in rain and on tough terrain. The heel counter is also very solid, something that I appreciated a lot after running in several pairs of shoes that have shoe counters that bend or get caught under your ankle when slipping them on. A good shoe counter keeps the rest of the shoe solid and well-maintained, which is important for those looking to use their shoes at the end of its training life. One of its difference from the classic Asics shoes is the slightly chunky material covering the side. Asics tries its hand at a more breathable material in the Roadhawk, with a seamless mesh top and tightened mesh sides. This feature was one that I felt vital to the success of the shoe. The pair aired out and dried quickly, even after training back-to-back in pouring rain two days in a row. Even more, the shoes kept very well from the top up, even after a complete season and 500+ miles on them. The Asics quality was maintained, and I still wear them around to walk in because of how new and nice they remain. Made of hard carbon rubber, the outsole of the Roadhawks held up for the entirety of the training season. The soft cushioning, however, between the rubber outsole began to wear down on both pairs of Roadhawks I’ve trained in, even after only some 200-300 miles. This is one of the weaker designs of the shoes. As you can see in the picture above, the inside softer parts of the outsole began to wear away. Ultimately, even though the shoes seemed to have more miles on them, the wearing away here worried me and I switched to a new pair after only some wear. Another weak design of the Roadhawk FF is the traction on the outsole. While the shoes remain very light—great for rain workouts—I felt like I was often about to slip when wearing them on wet pavement or grass. This was a huge problem in the duration of my training season. Typical of most Asics, the Roadhawk FF boasts of the Flytefoam midsole cushioning. In my opinion, the cushioning in the Roadhawk FF is lacking some smoothness in its ride. The shoe is responsive but despite the plethora of cushioning, it often feels rather hard. This quality of ride is quite unusual for Asics when compared to the infamous and heavy gel midsoles of its more classic shoes (the Nimbus, for example). However, I believe the Flytefoam also allows the shoe to be much lighter than other Asics shoes (6.7 oz). The lightness of the Roadhawk makes it a great racing flat or fast-paced workout trainer. While I did have a few calf tightness problems from the lack of support in the Asics Roadhawk FF, I thought they were a very reasonably priced shoe for the quality and quantity of miles you can get from them. 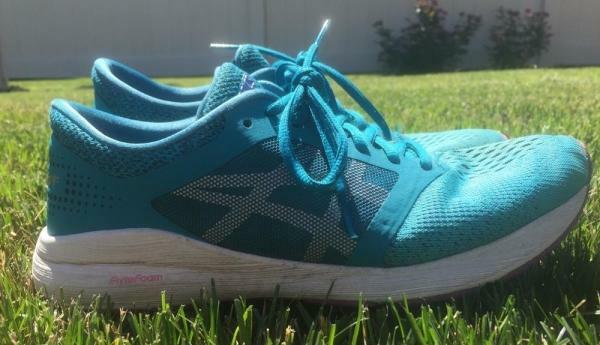 They certainly aren’t the same quality as the higher priced Asics shoes, but they make for a very solid pair of racing flats that you can find for about $100 anywhere. I happened to wear them for my training during a cross country season (cue lots of rough terrain, weird weather, and many many rough miles), which I think was a mistake. They would suit a lighter season full of the track or easy road running much better—especially because of their lightness and fit. Who would I recommend the Roadhawk FF for? Those who are looking for cheap alternatives to expensive running shoes & not necessarily ones that last for 500+ miles. Those who are looking for shoes for speedy runs/workouts on a relatively non-varied terrain. Those who are looking for shoes for that are decently durable racing flats that don’t completely lack support. You have a lighter weight shoes that you can use for daily training that I didn't even consider running a marathon in. The Asics Roadhawk FF boasts several interesting technologies that work together symbiotically to yield efficient results and keep the user running without feeling fatigued or worn out. It utilizes the same outsole material as the Asics Cumulus 20 and other reliable materials comprise the upper and midsole unit. The AHAR® outsole provides very good traction on a variety of surfaces and is durable. It maintains the shoe’s good health for longer periods of time. The FlyteFoamTM and the SPEVA® technologies in the midsole offer high comfortability and an excellent energy return to the users, potentially motivating them to run and perform better on the field. The ComforDryTM sockliner is placed right above the full-length mid-sole material. Its purpose is to add a bit more cushioning for the foot of the wearer. Its anti-moisture property prevents sweat from accumulating in the shoe and generating odor-causing bacteria. The Asics Roadhawk FF has a standard running length with a comparatively narrower toe-box. The neutral running shoe comes in the standard medium widths of D and B for men and women, respectively. This neutral shoe utilizes the much sought-after AHAR® material on its outsole for excellent traction on the asphalt, resistance to abrasion, and flexibility. It covers the mid-sole foam, acting as a protective sheath against wear and tear. The Asics RoadHawk FF uses the FlyteFoam material in its midsole. The technology aims to heighten the runner’s efficiency through ensuring an optimal mix of weight, comfortability and responsiveness. The SpEVA 45 finish makes sure to keep the underfoot platform as soft and smooth as possible. It makes sure that the transition between the edges of the mid-sole and the upper isn’t jarring or irritating to the foot. The ComforDry sockliner provides a customized feel of comfort to the user. It also staves off moisture because it has an anti-microbial property. The upper of the shoe is made of highly breathable synthetic materials that ensure a good amount of air circulation inside the shoe. Also, a seamless construction is applied in this section, which reduces the likelihood of irritation while also maintaining a soft and smooth feel to the interior. The air flow is increased further through the provision of a breathable fabric lining across the upper. The lace-up closure secures the foot in position, thereby preventing any wobbling inside the shoe, especially when running on steep slopes. The padded tongue and collar keep the foot in place and prevents it from exiting the shoe accidentally. It also gives a bit of cushioning for the top areas of the foot.